If you’re anything like me, this first week of the Trump administration has been a roller coaster of anger and disbelief. Marching behind the GLAD banner at The Women’s March in Boston, I had the inspiring opportunity to stand with GLAD family I’ve known since coming here ten years ago, and with people I just met that day. It reminded me, once again, that it is standing – and acting – together that gives us strength. Efforts are underway to attack access to healthcare, including dismantling the Affordable Care Act and reproductive healthcare. Millions of Americans nationwide will be affected. And these attacks will disproportionately hurt low income people, people of color, LGBTQ people, and people living with HIV. The Trump administration is targeting immigrants– people who help make our country stronger, not weaker – threatening sanctuary cities, and planning a divisive wall between us and a peaceful neighbor. Plans are being proposed to severely curtail the number of refugees accepted to the U.S. in the midst of massive humanitarian crises around the world. Muslim refugees, immigrants and citizens are being singled out based on false perceptions about their religious beliefs and practices. 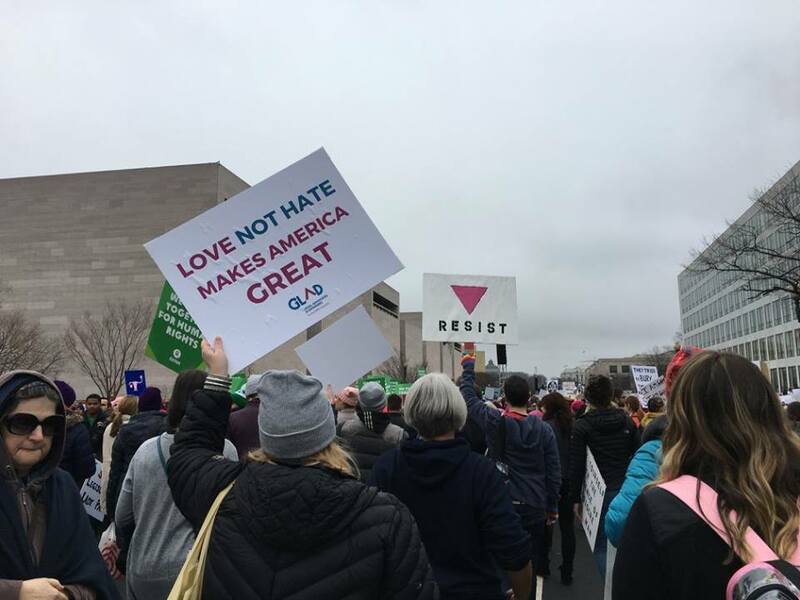 People fleeing war and strife, and those seeking safety and security for themselves and their families, include LGBTQ people – many of whom face persecution because of who they are and who they love. We’ve seen access to information and fact-based journalism come under attack.The White House has taken down page after page of issue- and community-specific sites including the page on civil rights, the Spanish language section of the White House’s official website, the webpage on climate change, and the LGBT rights page. We know that data, information, and evidence are critical to ensuring that our laws and policies reflect our real needs and lives. But this week also showed the power of solidarity and reinforced my belief that we really are one justice movement with endless possibility. I’m proud to be part of a GLAD community that stands up for all of our members and allies. Commit to regular action. Calling your elected officials and making your voice heard is vital. Make it a part of your routine. Dailyaction.org is one tool that sends you easy-to-use reminders right to your phone. Donate to GLAD and other organizations that you care about. Becoming a monthly donor will ensure we can respond rapidly and effectively to issues and crises as they come up. Support fact-based media. Let them know you’re paying attention and remind them that coverage of these issues matters. Know your rights. GLAD Answers is here to give you the information you need about LGBTQ and HIV rights, to provide referrals, and to offer help when you need it. Take care of yourself and others who are taking action. GLAD is in it for the long haul and we need you by our side. I’m proud to be part of a GLAD community that stands up for all of our members and allies. In the coming days, weeks, and months I look forward to keeping you updated, hearing from you, and continuing to fight together for justice for all.